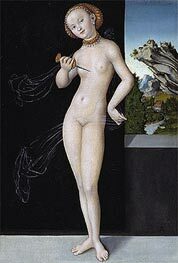 Lucas Cranach the Elder (1472 – October 16, 1553) was a German painter. He was born at Kronach in upper Franconia, and learned the art of drawing from his father. It has not been possible to trace his descent or the name of his parents. We are not informed as to the school in which he was taught, and it is a mere guess that he took lessons from the south German masters to whom Matthias Grunewald owed his education. But Grunewald practised at Bamberg and Aschaffenburg, and Bamberg is the capital of the diocese in which Cronach lies. According to Gunderam, the tutor of Cranach's children, Cranach signalized his talents as a painter before the close of the 15th century. He then drew upon himself the attention of the elector of Saxony, who attached him to his person in 1504. The records of Wittenberg confirm Gunderam's statement to this extent that Cranach's name appears for the first time in the public accounts on the 24th of June 1504, when he drew 50 gulden for the salary of half a year, as pictor ducalis. 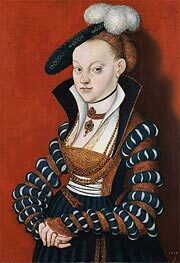 The only clue to Cranach's settlement previous to his Wittenberg appointment is afforded by the knowledge that he owned a house at Gotha, and that Barbara Brengbier, his wife, was the daughter of a burgher of that city. The first evidence of his skill as an artist comes in a picture dated 1504. We find him active in several branches of his profession, sometimes a mere house-painter, more frequently producing portraits and altar-pieces, a designer on wood, an engraver of copper-plates, and draughtsman for the dies of the electoral mint. Early in the days of his official employment he startled his master's courtiers by the realism with which he painted still life, game and antlers on the walls of the country palaces at Coburg and Locha; his pictures of deer and wild boar were considered striking, and the duke fostered his passion for this form of art by taking him out to the hunting field, where he sketched "his grace" running the stag, or Duke John sticking a boar. 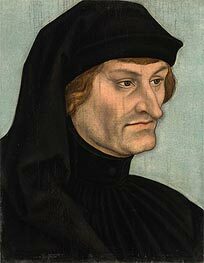 Before 1508 he had painted several altar-pieces for the Schlosskirche at Wittenberg in competition with Dürer, Hans Burgkmair and others; the duke and his brother John were portrayed in various attitudes and a number of the best woodcuts and copper-plates were published. 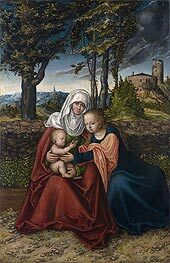 Great honour accrued to Cranach when he went in 1509 to the Netherlands, and took sittings from the Emperor Maximilian and the boy who afterwards became Charles V. Until 1508 Cranach signed his works with the initials of his name. In that year the elector gave him the winged snake as a motto, and this motto, or Kleinod, as it was called, superseded the initials on all his pictures after that date. Somewhat later the duke conferred on him the monopoly of the sale of medicines at Wittenberg, and a printer's patent with exclusive privileges as to copyright in Bibles. The presses of Cranach were used by Martin Luther. His chemist's shop was open for centuries, and only perished by fire in 1871. Relations of friendship united the painter with the Protestant Reformers at a very early period; yet it is difficult to fix the time of his first acquaintance with Luther. The oldest notice of Cranach in the Reformer's correspondence dates from 1520. In a letter written from Worms in 1521, Luther calls him his gossip, warmly alluding to his "Gevatterin," the artist's wife. 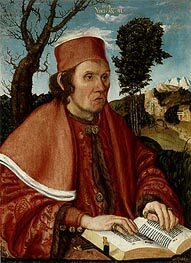 His first engraved portrait by Cranach represents an Augustinian friar, and is dated 1520. 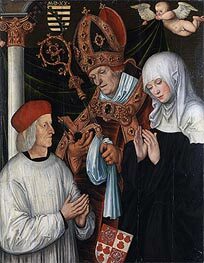 Five years later the friar dropped the cowl, and Cranach was present as "one of the council" at the betrothal festival of Luther and Katarina von Bora. The death at short intervals of the electors Frederick and John (1525 and 1532) brought no change in the prosperous situation of the painter; he remained a favourite with John Frederick I, under whose administration he twice (1531 and 1540) filled the office of burgomaster of Wittenberg. But 1547 witnessed a remarkable change in these relations. John Frederick was taken prisoner at the Battle of Mühlberg, and Wittenberg was subjected to the stress of siege. As Cranach wrote from his house at the corner of the marketplace to the grand-master Albert of Brandenburg at Königsberg to tell him of John Frederick's capture, he showed his attachment by saying, "I cannot conceal from your Grace that we have been robbed of our dear prince, who from his youth upwards has been a true prince to us, but God will help him out of prison, for the Kaiser is bold enough to revive the Papacy, which God will certainly not allow." 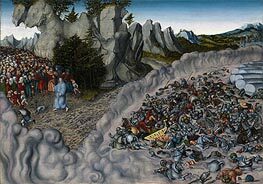 During the siege Charles bethought him of Cranach, whom he remembered from his childhood and summoned him to his camp at Pistritz. Cranach came, reminded his majesty of his early sittings as a boy, and begged on his knees for kind treatment to the elector. Three years afterwards, when all the dignitaries of the Empire met at Augsburg to receive commands from the emperor, and Titian came at Charles's bidding to paint Philip of Spain, John Frederick asked Cranach to visit the Swabian capital; and here for a few months he was numbered amongst the household of the captive elector, whom he afterwards accompanied home in 1552. 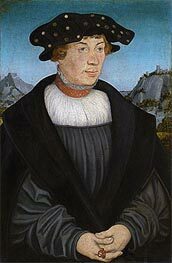 He died on the 16th of October 1553 at Weimar, where the house in which he lived still stands in the marketplace. The oldest extant picture of Cranach, the "Rest of the Virgin during the Flight into Egypt," marked with the initials L.C., and the date of 1504, is by far the most graceful creation of his pencil. The scene is laid on the margin of a forest of pines, and discloses the habits of a painter familiar with the mountain scenery of Thuringia. There is more of gloom in landscapes of a later time. 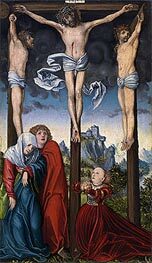 Cranach's art in its prime was doubtless influenced by causes which but slightly affected the art of the Italians, but weighed with potent consequence on that of the Netherlands and Germany. The business of booksellers who sold woodcuts and engravings at fairs and markets in Germany naturally satisfied a craving which arose out of the paucity of wall paintings in churches and secular edifices. Drawing for woodcuts and engraving of copperplates became the occupation of artists of note, and the talents devoted in Italy to productions of the brush were here monopolized for designs on wood or on copper. We have thus to account for the comparative unproductiveness as painters of Dürer and Holbein, and at the same time to explain the shallowness apparent in many of the later works of Cranach; but we attribute to the same cause also the tendency in Cranach to neglect effective colour and light and shade for strong contrasts of flat tint. Constant attention to mere contour and to black and white appears to have affected his sight, and caused those curious transitions of pallid light into inky grey which often characterize his studies of flesh; whilst the mere outlining of form in black became a natural substitute for modelling and chiaroscuro. 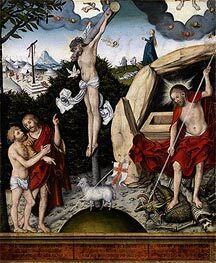 There are, no doubt, some few pictures by Cranach in which the flesh-tints display brightness and enamelled surface, but they are quite exceptional. It is curious to watch the changes which mark the development of his instincts as an artist during the struggles of the Reformation. At first we find him painting Madonnas. His first woodcut (1505) represents the Virgin and three saints in prayer before a crucifix. Later on he composes the marriage of St Catherine, a series of martyrdoms, and scenes from the Passion. After 1517 he illustrates occasionally the old gospel themes, but he also gives expression to some of the thoughts of the Reformers. In a picture of 1518 at Leipzig, where a dying man offers "his soul to God, his body to earth, and his worldly goods to his relations," the soul rises to meet the Trinity in heaven, and salvation is clearly shown to depend on faith and not on good works. Again sin and grace become a familiar subject of pictorial delineation. Adam is observed sitting between John the Baptist and a prophet at the foot of a tree. 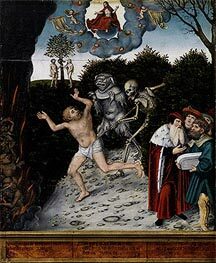 To the left God produces the tables of the law, Adam and Eve partake of the forbidden fruit, the brazen serpent is reared aloft, and punishment supervenes in the shape of death and the realm of Satan. To the right, the Conception, Crucifixion and Resurrection symbolize redemption, and this is duly impressed on Adam by John the Baptist, who points to the sacrifice of the crucified Saviour. There are two examples of this composition in the galleries of Gotha and Prague, both of them dated 1529. One of the latest pictures with which the name of Cranach is connected is the altarpiece which Cranach's son completed in 1555, and which is now (1911) in the Stadtkirche (city church) at Weimar. It represents Christ in two forms, to the left trampling on Death and Satan, to the right crucified, with blood flowing from the lance wound. 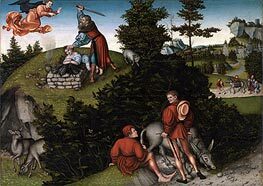 John the Baptist points to the suffering Christ, whilst the blood-stream falls on the head of Cranach, and Luther reads from his book the words, "The blood of Christ cleanseth from all sin." 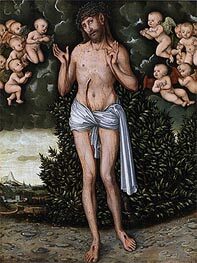 Cranach sometimes composed gospel subjects with feeling and dignity. 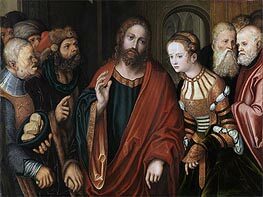 "The Woman taken in Adultery" at Munich is a favourable specimen of his skill, and various repetitions of Christ receiving little children show the kindliness of his disposition. But he was not exclusively a religious painter. He was equally successful, and often comically naïve, in mythological scenes, as where Cupid, who has stolen a honeycomb, complains to Venus that he has been stung by a bee (Weimar, 1530; Berlin, 1534), or where Hercules sits at the spinning-wheel mocked by Omphale and her maids. Humour and pathos are combined at times with strong effect in pictures such as the "Jealousy" (Augsburg, 1527; Vienna, 1530), where women and children are huddled into telling groups as they watch the strife of men wildly fighting around them. Very realistic must have been a lost canvas of 1545, in which hares were catching and roasting sportsmen. In 1546, possibly under Italian influence, Cranach composed the "Fons Juventutis" ("Fountain of Youth") of the Berlin Gallery, executed by his son, a picture in which hags are seen entering a Renaissance fountain, and are received as they issue from it with all the charms of youth by knights and pages. 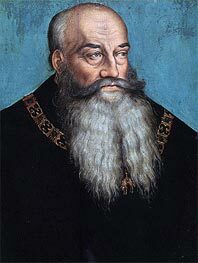 Cranach's chief occupation was that of portrait painting, and we are indebted to him chiefly for the preservation of the features of all the German Reformers and their princely adherents. But he sometimes condescended to depict such noted followers of the papacy as Albert of Brandenburg, archbishop elector of Mainz, Anthony Granvelle and the duke of Alva. A dozen likenesses of Frederick III and his brother John are found to bear the date of 1532. It is characteristic of Cranach's readiness, and a proof that he possessed ample material for mechanical reproduction, that he received payment at Wittenberg in 1533. for "sixty pairs of portraits of the elector and his brother" in one day. 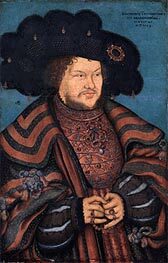 Amongst existing likenesses we should notice as the best that of Albert, elector of Mainz, in the Berlin museum, and that of John, elector of Saxony, at Dresden. 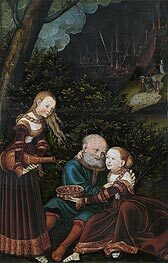 Cranach had three sons, all artists: John Lucas Cranach, who died at Bologna in 1536; Hans Cranach, whose life is obscure; and Lucas, born in 1515, who died in 1586. This section attempts to extrapolate some of the regards Cranach may have held towards women by examining some of the letters he has written to Luther and some paintings that he had done which bore a religious theme. 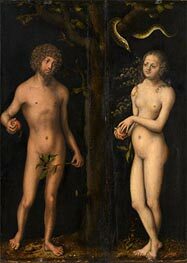 Sources regarding Cranach's early life has indicated that he was in fact not a mysogynist, or a woman-hater. Far from it, he has been a friend and companion of girls and young maidens in his hometown of Cronach throughout his childhood and adolescence. As he had revealed in his diary, "I could never understand the attitudes held by common men towards that of the other gender. How could a gender with such grace, softness of voice, slender of curvature, fineness of appearance and exquisiteness of manners have been termed the seducer of Adam and be blamed for humanity's ultimate downfall from Eden, but alas, my mind is wandering on the dangerous fringe of hypocrisy and I must not allow this discourse to proceed any further. In a later entry of Cranach's diary he has indicated the inspiration of some of his original artwork to have been stemmed from his observation of girls playing in the suburbs of his neighbourhoods on the "idle afternoons" when folks Cronach went for picnics and such, "I am all the more glad that the rules and customs of my homeland towards that of the fairer gender has been more laxed. Girls and younger maidens are oft seen playing and idling away one afternoon after another on the beautiful green pastures in the suburbs, along with the beautiful blue sky with the occasional cloud strewn about it like the graceful white gown of the young ladies,forms a picture that, in my mind, represents nothing less than a divine inspiration.I have recently completed several oil-canvas paintings of exclusive quality that depicted nothing but these beautiful afternoon suburb gatherings, in which you may occasionally find a single lone figure standing in the background, quietly appreciating God's handiwork and everything He hath provided for us, including the companion of this much superior gender, which through perhaps misfortunes of birth or accidents of fate has come to be known as the seducer of Men." 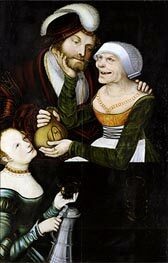 Later historical resources shows Cranach's marriage to his wife to be an exceedingly happy one. 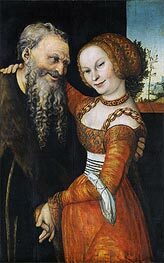 As Cranach notes again in his diary on the day of his marriage, "I have had the most fortune to have found myself a maiden whose virtue and beauty are unexceled by those of her peers. How kind God must have been on me, to have awarded me with such a graceful wife. Alas, I am so overjoyed that I have inadvertently treated wife as an object of inanimation, something to be awarded. Yet I must not think this way. I believe that my wife has been the most kind in entering this connubial contract with a man as petty as me, and if I were not to be able to provide to her in a manner that is not resonant with her material and emotional expectations, I shall be glad to let her go, to dissolve our communion at the risk of excommunication. But I know these things happenth not, for the marriage of her and I shall last to time indefinite." (Note that this diary entry was made before Martin Luther has launched the Protestant movement. So Cranach is by default a Catholic). 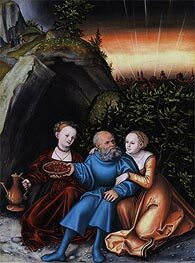 Cranach's diary entry at the time of the anniversary of his marriage confirmed his satisfactory married life with his wife and of his favorable opinion of women, "It has been a year now since we have wed. And I have often wondered how I could have made it through this year without the marriage. To me everyday for the past year has been an experience that I found delicious and savoring. To me the sun shone brighter and the birds chirpped merrier even though I know that to be just a effect of my heart, which has been made blisful by the presence of my beautiful wife. She is now 6 months pregnant with the protrusions being made more pronounced with each passing day. I sincerely hope it to be a daughter, despite assorted effusions to the contrary, I am personally convinced that I shall not be able to pamper a son as much as I do a daughter. 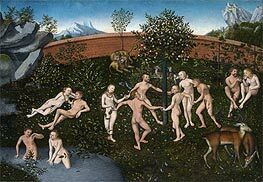 But all in all, I find this matrimony to be of such an exceeding quality that I am beginning to doubt if my wife and I had been the very first couple to be placed in the Garden of Eden by God Himself, could Humanity have given into the temptation of the Devil and fell from the paradise in the first place? But this is heretical thinking, I must stop my idle personal musings here." "...and exalted shall be He who hath the wisdom of creating this circle of matrimony in which man and woman come together to fill and subdue the Earthe with their procreative powers. And exhalted shall be He who hath made the companions of Men, even be they the supposed ones to have fallen to the Serpent's allure, the grace and softness with which they tend to their children and family shall have redeemed whatever sin they have committed to begin with ..."